What Is One A Day Women's Menopause Formula? One A Day Women's Menopause Formula is a complete multivitamin that is formulated with natural soy isoflavones to help address symptoms related with the menopausal transition, such as hot flashes and mood swings. It also contributes to heart, skin, and bone health. One A Day Women's Menopause Formula has a variety of ingredients that work together to relieve menopause symptoms and positively influence overall health. For example, its soy isoflavones, which are potent phytoestrogens, help replenish the body of its lost estrogen, subsequently remedying the hormonal imbalance. Also, the extra added vitamins (such as A and D) supports healthy immune function, skin, bone health, and more. Vitamin C - necessary for the absorption of iron, a healthy immune system, wound healing, etc. Calcium Carbonate, Powdered Soybean Isoflavones Extract, Microcrystalline Cellulose, Magnesium Oxide, Ascorbic Acid, dl-Alpha-Tocopheryl Acetate; Less than 2% of: Beta-Carotene, Biotin, Cholecalciferol, Chromium Chloride, Croscarmellose Sodium, Cupric Oxide, Cyanocobalamin, D-Calcium Pantothenate, FD&C Blue #2 Lake, FD&C Red #40 Dye, FD&C Red #40 Lake, Folic Acid, Hydroxypropyl Methylcellulose, Manganese Sulfate, Niacinamide, Polyethylene Glycol, Polyvinyl Alcohol, Potassium Iodide, Pyridoxine Hydrochloride, Riboflavin, Silicon Dioxide, Sodium Molybdate, Sodium Selenite, Stearic Acid, Talc, Thiamine Mononitrate, Titanium Dioxide (color), Vitamin A Acetate, Zinc Oxide. This product does not contain gluten, wheat, or dairy and claims not to contain any artificial flavors or artificial sweeteners either. This product is not recommended for women who are pregnant, nursing, or have a history of cancer. If you wish to use it anyways and have the aforementioned conditions, consult with a trusted medical healthcare professional first. The One A Day site mentions no side effects. Also, the product label has no information about side effects from short-term or long-term use either. However, users on Amazon mention side effects of headaches, dry mouth, increased appetite, and intestinal problems as well as increased occurrences of night sweats and hot flashes. Positive reviews credit One A Day's product for relieving their menopausal symptoms of irritability, hot flashes, insomnia, night sweats, fatigue, and more. They also praise the supplement for being a multivitamin at the same time. Negative reviews claim that the product simply didn't work and caused side effects of headaches, allergic reactions, and worsened symptoms. Various reviewers also mention health concerns from ambiguous ingredients added into the blend. No further sources of reviews present on other reputable websites. Take one tablet daily with food. Keep out of reach of children. 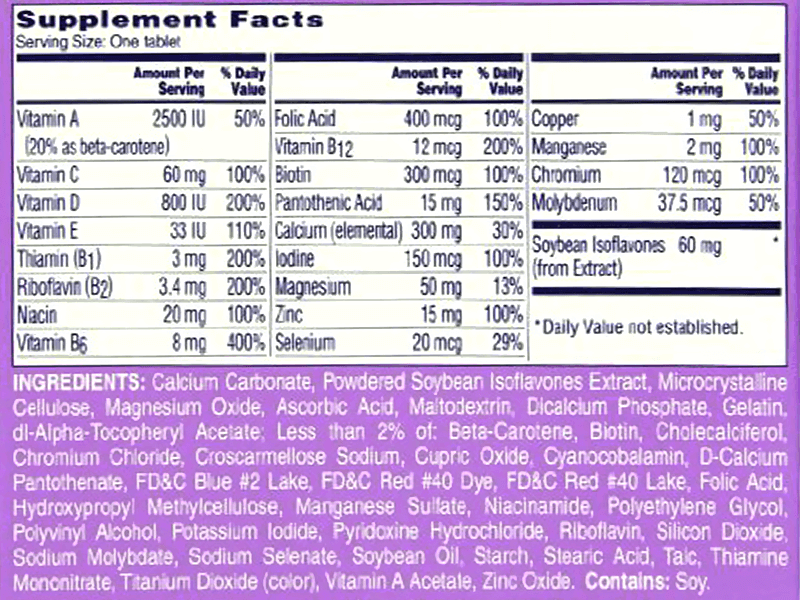 One A Day Women's Menopause Formula can be purchased from Amazon or Walmart. When purchasing from the company website (www.oneaday.com), you will be directed to one of the two aforementioned retailers to complete the transaction. The supplement may be found available for purchase at pharmacies such as CVS and Rite Aid, too. 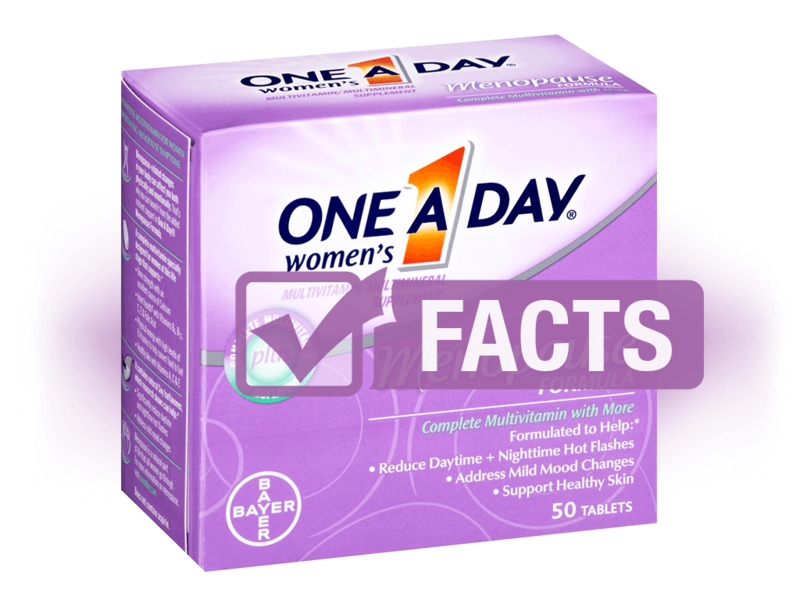 One A Day® is a registered trademark.